Cyrtolite: Mineral information, data and localities. Name refers to its curved crystal faces. From the Greek κνρτος, for bent. Cyrtolite is a hydrous Th+U bearing zircon (up to 27 mas.% of sum). It sometimes occurs with curved, rounded crystals. Dana's Textbook of Mineralogy by W.E. 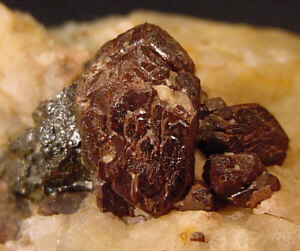 Ford (pg 611, 4th ed., 1947) treats cyrtolite as a chemical variety of zircon that "contains uranium, yttrium, and other rare elements". Any old zircon containing uranium will be metamict. Jeffrey de Fourestier in Glossary of Mineral Synonyms (pg 89, Special publication #2, Canadian Mineralogist, 1998) calls cyrtolite a metamict zircon. Originally reported from Rockport, Essex Co., Massachusetts, USA, by W.J. Knowlton in Art. XXIV Contributions to Chemistry from the Laboratory of the Lawrence Scientific School, No. 4, On a new mineral from Rockport, Mass. in Am. Jour. Sci., 2nd Series, vol. XLIV, no. 131, pp 224-226, (1867). Uranpyrochlore (of Hogarth 1977) 14 photos of Cyrtolite associated with Uranpyrochlore (of Hogarth 1977) on mindat.org. 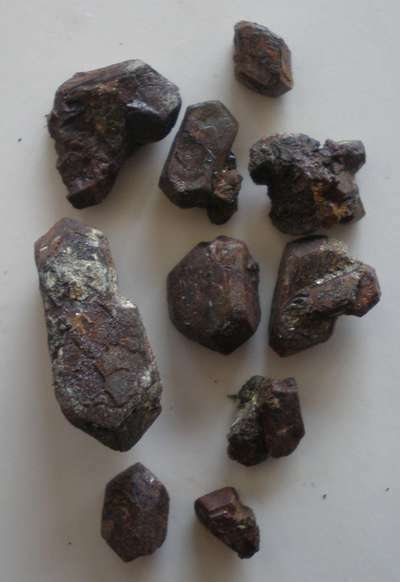 Uraninite 11 photos of Cyrtolite associated with Uraninite on mindat.org. Quartz 9 photos of Cyrtolite associated with Quartz on mindat.org. Fergusonite-(Y) 8 photos of Cyrtolite associated with Fergusonite-(Y) on mindat.org. Gummite 8 photos of Cyrtolite associated with Gummite on mindat.org. Pyrrhotite 7 photos of Cyrtolite associated with Pyrrhotite on mindat.org. Microcline 6 photos of Cyrtolite associated with Microcline on mindat.org. Pyrochlore Group 6 photos of Cyrtolite associated with Pyrochlore Group on mindat.org. Chalcopyrite 5 photos of Cyrtolite associated with Chalcopyrite on mindat.org. Cryolite 5 photos of Cyrtolite associated with Cryolite on mindat.org. 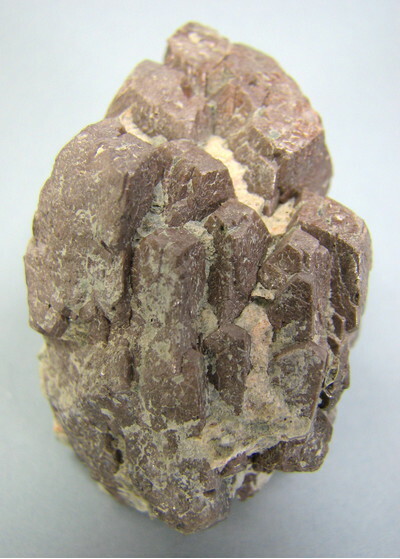 The following Cyrtolite specimens are currently listed for sale on minfind.com. Fernando R.M. Pires and A. Raphael Cabral (1998) The Volta Grande pegmatites, Minas Gerais, Brazil: an example of rare-element granitic pegmatites exceptionally enriched in lithium and rubidium: Discussion. The Canadian Mineralogist, 36, 1157-1158. Hewitt D.F. (1967) Pegmatite Mineral Resources of Ontario, Ontario Department of Mines, Industrial Mineral report 21, p.54. Hong Zhong, Weiguang Zhu, Zhuyin Chu, Defeng He, and Xieyan Song (2007): Chemical Geology 236(1/2), 112-133. Alain Hanson specimen (see http://www.mindat.org/forum.php?read,11,161069,161421,quote=1); Monteyne-Poulaert, G., Delwiche, R., Safiannikoff, A., & Cahen, L. (1962). Ages de minéralisations pegmatitiques et filoniennes du Kivu méridional (Congo oriental). Indications préliminaires sur les âges de phases pegmatitiques successives. Annales de la Société Géologique de Belgique, 71, 272-295. Dahlkamp, F.J., Ed. (2009): Uranium Deposits of the World: Asia. Springer (Berlin, Heidelberg), pp. 191-268. N. MALYUKOVA , (2014) Zoning of Polymetallic Rare-earth and Rare-metal Deposits in the Ak-Tyuz Ore Field (Northern Tien Shan, Kyrgyzstan). Acta Geologica Sinica (English Edition), 88(supp. 2): 451-453. Beck, A.C., Reed, J.J., Willett, R.W. (1958) Uranium mineralization in the Hawks Crag Breccia of the Lower Buller Gorge Region, South Island, New Zealand. New Zealand Journal of Geology and Geophysics 1:3, 432-450. Gordienko, I. V., Roshchektaev, P. A., & Gorokhovsky, D. V. (2016). Oka ore district of the Eastern Sayan: Geology, structural–metallogenic zonation, genetic types of ore deposits, their geodynamic formation conditions, and outlook for development. Geology of Ore Deposits, 58(5), 361-382. Y.A.Kogevnikov "Samotcvetnie tropi",Moscow,Mir Samotcvetov, 2010, 56p. Patyk-Kara, N.G., Levchenko, E.N., Stekhin, A.I., Barsegyan, V.V., Bochneva, A.A., Chizhova, I.A., Andrianova, E.A., and Dubinchuk, V.T. (2008): Geology of Ore Deposits 50(3), 218-239. Anthony, J.W., et al (1995), Mineralogy of Arizona, 3rd.ed. : 431. Anthony, J.W., et al (1995), Mineralogy of Arizona, 3rd. ed. : 394; Pabst & Woodhouse (1964); Fitzpatrick, J. & Pabst, A. (1986), Thalenite from AZ, Am.Min. : 71:188-193; Galbraith, F.W. & Brennan (1959), Minerals of AZ: 99. Anthony, J.W., et al (1995), Mineralogy of Arizona, 3rd. ed. : 431. Troxel, Bennie Wyatt & P.K. Morton (1962), Mines and mineral resources of Kern County, California: California Division Mines & Geology County Report No. 1, 370 pp. : 290; Murdoch, Joseph & Robert W. Webb (1966), Minerals of California, Centennial Volume (1866-1966): California Division Mines & Geology Bulletin 189: 392.; Troxel, Bennie Wyatt & P.K. Morton (1962), Mines and mineral resources of Kern County, California: California Division Mines & Geology County Report No. 1, 370 pp. : 27; Murdoch, Joseph & Robert W. Webb (1966), Minerals of California, Centennial Volume (1866-1966): California Division Mines & Geology Bulletin 189: 166. Murdoch, Joseph & Robert W. Webb (1966), Minerals of California, Centennial Volume (1866-1966): California Division Mines & Geology Bulletin 189: 166, 271. Hewett, Donnel Foster & Jewell Jeannette Glass (1953), Two uranium-bearing pegmatite bodies in San Bernardino County, California American Mineralogist: 38: 1044, 1048; Murdoch, Joseph & Robert W. Webb (1966), Minerals of California, Centennial Volume (1866-1966): California Division Mines & Geology Bulletin 189: 104, 166, 392; Seaman, A.E. (1976), Pegmatite Minerals of the World. ⓘ North Street mall ? In the collection of Kevin Czaja. ⓘ Worth and Selden Quarries (Victoria Quarry) ? Emerson, Geology of Massachusetts and Rhode Island, 1917. (USGS Bulletin 597), p.257. Richmond, W. E. Jr. (1936): Paragenesis of the Minerals From Blueberry Mountain, Woburn, Massachusetts (American Mineralogist 22:290). The Minerals of New York City & Its Environs, New York Mineralogical Club Bull. Vol. 3, No. 1, Manchester, J.G. (1931): 39-44. The Minerals of New York City & Its Environs, New York Mineralogical Club Bull. Vol. 3, No. 1, Manchester, J.G. (1931): 39 & 45-46. Rocks & Min. : 6:117, 123; 10:86; 23:710-712. Rocks & Min. : 60: 91. Miller, C.E. (1972) Rhode Island Minerals and Their Locations. O.D. Hermes, ed. Kingston, RI. Crook, Wilson W. III (1977) The Clear Creek pegmatite: a rare earth pegmatite in Burnett County, Texas. 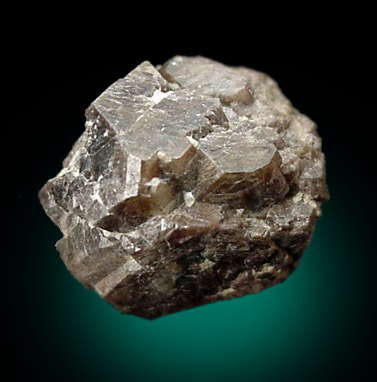 Mineralogical Record, 8 (2): 88-90.; Crook, Wilson W. III (1977) Texasite, a new mineral: the first example of a differentiated rare-earth species. American Mineralogist: 62: 1006-1008.